"American soldiers in Vietnam complained bitterly about the lack of support from their fellow Americans at home. But nonsupport for our fighting men is nothing new. Profiteering in war and dodging the draft are long-standing American traditions. "During the American Revolution, almost as many inhabitants of the American colonies fought for the British as for the Continental Army: seven thousand loyalists versus eight thousand patriots. During the brutal winter at Valley Forge, George Washington's troops were starving not because there was no local food available, but because the colonial farmers preferred to go to Philadelphia and sell their food to the British, who could pay more. "Even more treacherous was the War of 1812, in which two thirds of the beef eaten by the British army was provided by American traders. Without this food, the British army could not have survived against the Americans. Rail against this though he might, President James Madison could do nothing: his more basic problem was finding enough men to fight. Out of a vast force of 500,000 men called upon to serve, only 35,000 troops were in uniform at the war's peak in 1814. And this total was achieved only by offering generous bounties to prospective recruits, who rarely served more than a year anyway. "In the Civil War, Abraham Lincoln relied on the states to raise volunteers -- an effort derided by General William Tecumseh Sherman as 'putting out the flames of a burning house with a squirt gun.' When it became clear that the war would drag on and would require longer terms of service duty, President Lincoln resorted to forced conscription. 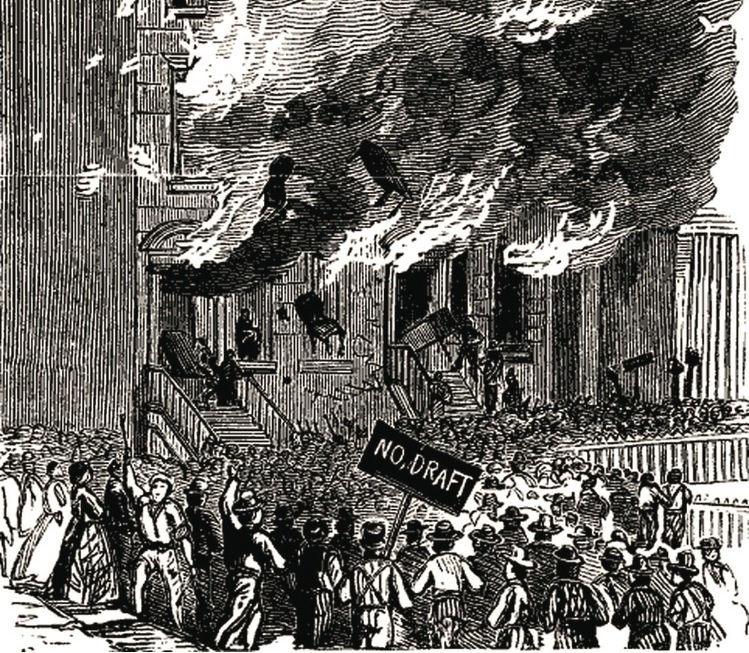 The 1863 Enrollment Act, requiring all able-bodied males to register for three-year service, was not well received: New York City was racked by a bloody four-day draft riot, and thousands of recruits -- including a future US. president, Grover Cleveland -- paid the government a $300 'commutation' fee to escape service. Instead of raising the needed 300,000 troops, the Enrollment Act raised only 150,000 -- and three quarters of those were paid 'substitutes.' In the South, conscription problems were even worse. Whereas the Confederacy had a half-million men under arms in 1863, within a year the number had plummeted to 200,000. The war ended with more Southern troops literally hiding out in the woods and under haystacks than reporting to duty. "Even our most popular war -- World War II -- had its conscription problems. The United States Army in 1936 ranked twenty-first in the world in size, right behind the armies of Argentina and Switzerland. In 1938 the Ludlow Amendment, requiring that any declaration of war first be subject to popular referendum, fell just 5 percent short of being presented to Congress for a vote as a constitutional amendment. In late 1941, with fighting raging throughout Europe, and China being overrun by Japan, a desperate President Roosevelt urged Congress to renew the one-year draft law. The law passed, but by only one vote. "A one-time freakish period of isolationism? Hardly. During the middle of the war, the US. troop contribution was far less than Great Britain's. FDR made continual requests for more troops; most times Congress turned him down."